First the bad news: public attitudes in Afghanistan regarding the U.S. presence, who they blame for violence, and life in general are worse than they were five years ago. And the good news: these same attitudes seem to have bottomed out last year and are now improving. 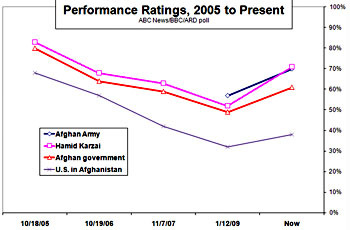 This all comes from a recent ABC/BBC poll of Afghanistan, and some of the results are peculiar. Support for Hamid Karzai is surprisingly high (71% say he’s doing excellent or good work) — and 75% say they’re satisfied with last year’s election results — despite the fact that over half the country thinks the election was marked by fraud. And positive ratings for the U.S. presence, though a little bit higher than last year, have plummeted since 2005, going from 68% to 38%. On the unalloyed bright side, however, only 8% of Afghans now think that attacks on U.S. forces are justified. That’s way down both from 2005 and from last year. This is mostly just raw data. Maybe it means something, maybe it doesn’t. But somehow, a combination of Barack Obama’s election, a greater U.S. focus on Afghanistan, more wanton Taliban depredations, and changes in U.S. tactics seem to be making a difference. Keep your fingers crossed.